Keeping centipedes and millipedes as pets is a fascinating hobby. Both are enjoyed for their interesting appearance and behaviors. But there are very important differences between a centipede and a millipede. A millipede is a great first arthropod to keep as a pet. It is safe even for children, with supervision. A popular pet available in pets stores is the African Giant Millipede, which can grow up to 10 inches in length. Other pets can be collected from the wild. However if you obtain a brightly colored specimen, they can secrete hydrogen cyanide, which can cause a burning sensation on sensitive skin. A centipede on the other hand, is for advanced keepers only. Centipedes are venomous and potentially dangerous to humans, especially children. Centipedes are unlike most invertebrate pets being kept in captivity. They should be kept similarly to venomous snakes with a secure enclosure system. Once they are established in a secure enclosure and once some experience is gained in their care and daily husbandry, centipedes can provide hours of fascination. Myriapods make great pets when you are simply looking for something different and interesting. This information on housing, foods, and care requirements will help you understand these types of pets. From here, go learn about your individual pet's behaviors and needs. Understand the type of pet you are getting to know what to expect and what to do. This will maximize your enjoyment, as well as the life and health of your pet. For information guides on individual species, see: Centipedes and Millipedes, Guides to Myriapod Species. Centipedes are land dwelling invertebrates that comprise the class, Chilopoda. There are about 8000 species in the world, with about 2,500 of them named. There are many kinds of Centipedes, but they are all rather flattened worm-like animals. Their bodies are divided into segments. The first segment is a head with a pair of antennae and the rest of the segments each have a pair of legs attached. Most centipedes are between 1.5 to 2" (4 - 5 cm) in length with about 15 pairs of legs. But their sizes do range from 0.8" to 12" (2 - 30 cm) and they can have from 15 to 191 pairs of legs. 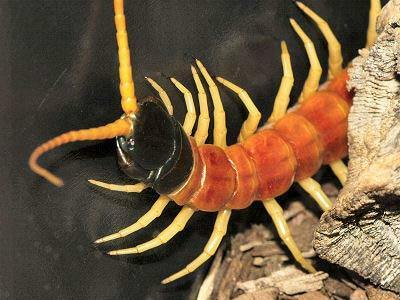 The largest centipede is Scolopendra gigantca (12") from the tropics of Central America. Centipedes are almost totally predatory, fast moving, and aggressive. They are very active and will quickly scurry away from a disturbance. They usually prefer moist habitats or areas of high humidity. Centipedes can be quite long-lived, some have been known to live up to 6 years. Centipedes are fascinating pets for advanced hobbyists. However, they are not pets to be handled, rather they are visual pets enjoyed for their interesting appearance and behaviors. Although they are not considered aggressive towards humans, centipedes to not like to be cornered or touched and will respond defensively in such situations. Note: Centipedes are not for the beginner! Centipedes are potentially dangerous and should only be kept by an advanced hobbyist. Centipedes do not sting, but have a pair of poison claws behind the head and use the poison to paralyze their prey, usually small insects. Though it is reported in some places on-line that the jaws of centipedes are weak and can rarely penetrate human skin, most of the larger specimens being sold as pets can indeed give a very painful bite (or pinch). Careless individuals who are bitten can expect fairly intense pain, swelling, and a throbbing sensation. Depending on the species, this pain will last from an hour to several hours. Though fascinating to watch, centipedes should be carefully manipulated with snake handling tools, paint brushes, and thick gloves, rather than handed. Centipedes are unlike most invertebrate pets being kept in captivity. They should be kept similarly to venomous snakes with a secure enclosure system. Once they are established in a secure enclosure and once some experience is gained in their care and daily husbandry, centipedes can provide hours of fascination. Millipedes are land dwelling invertebrates that comprise the class, Diplopoda. This class contains about 10,000 species. Millipedes bodies are divided into segments with two pairs of legs per segment. However they have no legs on the first segment behind the head, and then only one pair of legs on the next few segments. But there are two pairs of legs per segment after that. Millipedes differ from Centipedes in body shape, being more cylindrical rather than flattened. Also, while centipedes have only a single pair of legs atttached to the sides of each body segment, millipedes generally have 2 legs per segment and they are attached near the ventral midline. These are mostly slow moving detritivores, that feed on decaying leaves and other dead plant matter. They range in size from about 2" to 10" inches in length, and as they grow they shed their skin. Some grow very large, up to a foot long. They are long lived, hardy, and can also be handled some. Millipedes They are among the easiest pet arthropods to care for. Many species can get quite large and they can be kept together in colonies. They are gentle, nocturnal invertebrates that are long lived, hardy, and easy to care for. They make good pets because they harmless, and can't bite you. As far as handling, most are quite safe, but the brighter colored species can secrete hydrogen cyanide. This is a toxic chemical which can cause a burning sensation on sensitive skin. Wash your hands with soap and water before and after handling millipedes. Myriapods do well in enclosures with plenty of floor space. They will spend a great deal of time exploring their enclosure at night, searching for a tasty meal. We use 20-gallon terrariums for most of our larger specimens. Smaller specimens can be kept in 10-gallon terrariums. A tightly fitting screen lid should be provided. If you have small children in your home, a lid with securing clips is probably warranted. We like the taller enclosures because it gives you space to be creative with live plants, driftwood, cork bark, etc. and the top of the enclosure is not easily reached by the exploring myriapod. Many keepers house their myriapods in large (9 to 10") deli tubs. These tubs make suitable housing for those with large collections as they stack easily on a shelf. They must be perforated and the myriapods must be watched daily to make sure their humidity needs are met. One of the benefits of a deep substrate in a larger terrarium is that myriapods in these types of enclosures can be neglected occasionally and the humidity will remain acceptable. There have been reports of some myriapods actually "chewing" out of these plastic tubs. In nature myriapods are found in a variety of habitats, but most seen to prefer moist protected places such as under stones, rotted logs, leaves or bark. A mixture of ½ play sand and ½ peat moss or coconut bedding works well for specimens from drier habitats such as Arizona and west Texas. For tropical species, you can use a mix of ¼ play sand and ¾ coconut bedding and peat moss. Dampen it initially and then once a week spray the enclosure. Make one end of the enclosure a little damper than the other so the myriapod can choose the amount of dampness it requires. Providing a large piece of flat cork bark, tree bark, or other shelter adds some security for the myriapod. You can also place some dried leaves and small sticks to the enclosure to add to the interest. Though they remain hidden by day, the myriapod enclosure can be fitted with a red or blue bulb. This bulb can be turned on at night and the keeper can watch the myriapod foraging for prey and exploring its surrounding. Centipedes and Millipedes have very different dietary requirements. Centipedes are carnivores that eat prey, while Millipedes are detritivores, that feed on decaying leaves and other dead plant matter. The great thing about keeping millipedes as pets is how easy they are to feed. They will eat pretty much eat almost any fruit or vegetable you offer. They also require calcium in their diets in order to shed their skin for proper growth. Centipedes feed very well on a wide range of prey. Feed crickets and roaches once a week. Once a month feed larger specimens a small pink mouse. Myriapods will also feed on grasshoppers, moths, worms, and even small vertebrate prey, but be cautious of any prey that is captured in nature as they may be carriers of internal parasites. Keep in mind that overfed invertebrates, and especially overfed centipedes, seem to die much sooner than those that are kept "lean and mean". Orin McMonigle, Giant Centipedes: The Enthusiasts Handbook, Elytra & Antenna 2004. J. L. Cloudsley-Thompson, Spiders, Scorpions, Centipedes, and Mites,.Pergamon Press 1968. R. F. Lawrence, The Centipedes and Millipedes of Africa, A guide, A. A. Balkema Capetown, Rotterdam, 1984.